After a strong and engaging installation exhibition for their inaugural show (Even Clean Hands Leave Marks and Damage Surfaces), Detroit Industrial Projects is back in a new space, (still within the hulking Russell Industrial Complex) with a new group of artists. Despite the changes, it’s good to note that the energy and presence that made that first show such a treat, has been maintained in this very different sort of exhibition. The space is divvied up between the five artists, each working on a designated area, with some bleed in the area between. Director Jeanette Strezinski has brought together a mix of established Detroit artists along with new kids on the block. It works. There’s definitely a common aesthetic that binds them together, and they each offer a shared sensibility that resonates as being very Detroit. 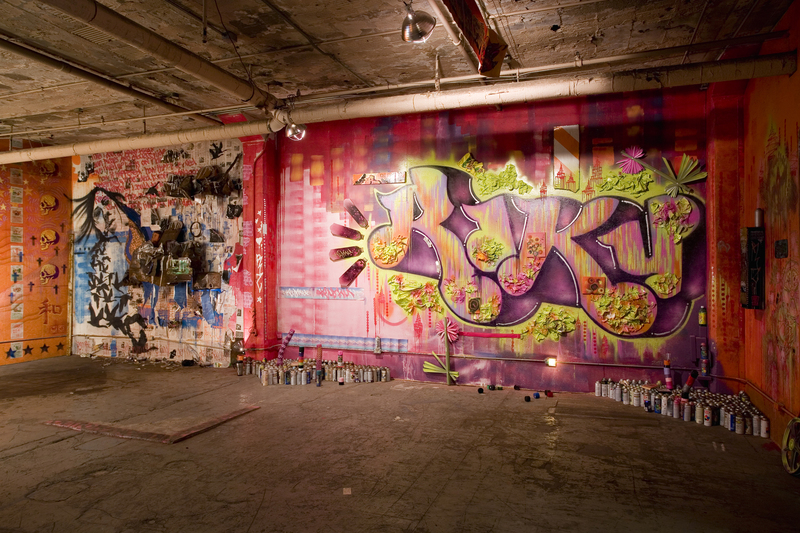 This is urban landscape as interior – adorned with graffiti and pieces made from found objects. Stepping from the massive, nondescript corridor through the entrance into the space is a bit like crash landing in Oz from black and white Kansas. It’s an almost overwhelming explosion of color and imagery. Letting one’s eyes acclimate, we can proceed and take in what the individual artists have brought to the space. Katie Ares’ installation is up first, immediately to the right of the entranceway, and sets a strong tone for the entire show. She’s left no part of the wall surface untouched, spraying it with bright red, orange, and yellow, and leaving the discarded spray cans arranged on the floor to become part of the composition. Her personal tag “Riku” is painted big and bold, as we would see (and no doubt can see somewhere) on a chunk of abandoned building or concrete support and the color and paint handling add to this, appearing to weather as if exposed to the elements. 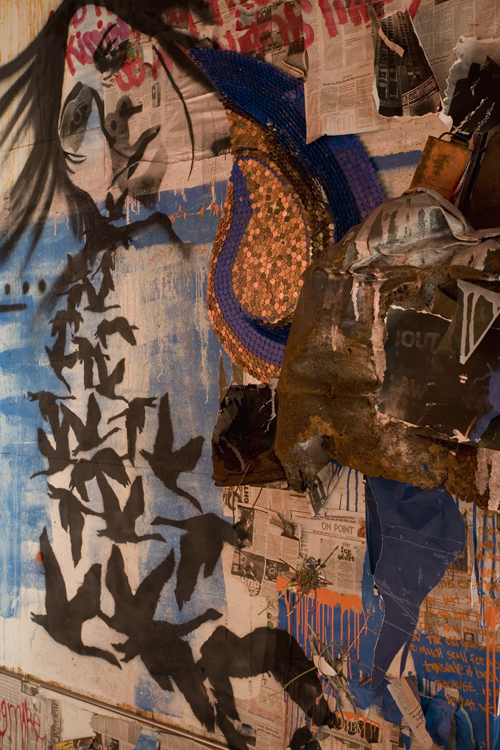 In addition to the design elements in paint, she’s incorporated plastic trash to give the wall texture, and build up deeper layers of meaning. It’s pretty cool to see something like this indoors – not as photo – but able to spend time and truly digest all the different elements Ares brings to her composition. On the same wall as Ares, Lindsay Jewell also works in spray paint, stencil, and found objects, upon a wall coated entirely in newspaper, and does a nice job incorporating the painted imagery with the refuse and found objects attached to the wall. This is quite illustrational, as Jewell’s created a dreamscape of sorts. Appropriately then, there’s an image resembling comics’ Sandman and a flock of geese in silhouette flying through the composition, which also includes diaristic scrawling. There’s a story or at least a moment preserved here. 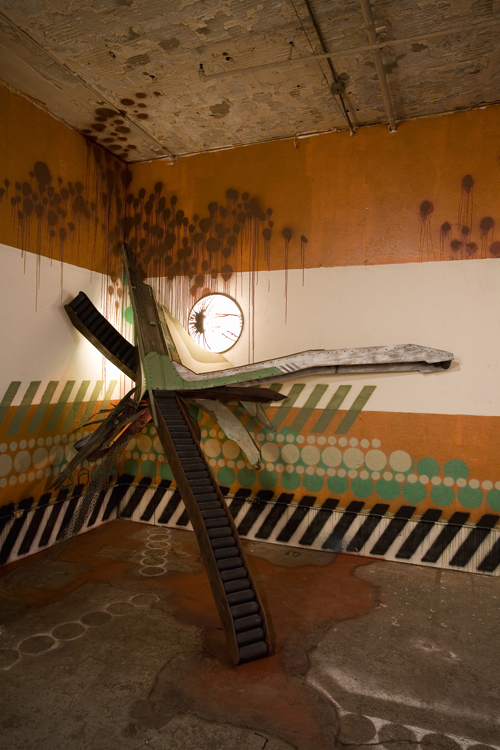 To the left of the entrance, Scott Berels creates an installation flowing around the entranceway from Ares’. This is almost diorama at actual size, as he builds what could be an existing corner of the landscape quite completely. Design elements including repeated rectangles and circles, and one giant arrow, provide movement through the composition. These bits move the eye out of the work, and then we’re drawn back in through what is the centerpiece of the work – the remains of perhaps a small conveyor belt works, leaning up against the corner, keeping the flow going. On the exterior edge, he’s erected wood to stand in for a telephone pole on the wall with wires emanating from it to stretch to the interior column of the room, complete with shoes strung over them. It’s a very whole landscape as Berels works the floor into it, and even the lighting comes from a circular bubble behind the conveyor belt, which works well with the circular motif running through the design. On the wall opposite the entrance, celebrated rock poster artist Mark Arminski brings his unique style to the mix. Arminski always makes great use of juxtaposing diverse iconography along with text, and this entire wall, in spray paint and stencil is no exception. 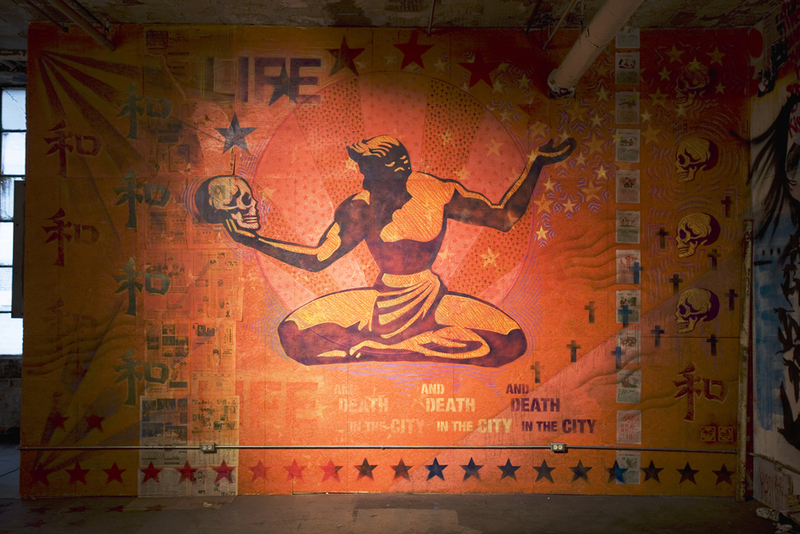 It’s the Spirit of Detroit, holding in not the family unit, but a skull – a statement about the city and a nod to Shakespeare’s “Alas poor Yorick.” Repeated text reads, “and death in the city,” and further images of crosses at multiple scales, skulls, and stars make up the composition. Arminski pays great attention to detail, always maintaining clean lines on this dense but never busy composition. In the somewhat offset second space of the room are the works of sculptor Tim Burke, resident of Heidelberg Street – his own house being an ongoing installation project and a part of the vitality of that street. His website offers “Things never die… old things always contain the seeds of the new.” And no truer words could be said about his work – often cartoony figurative pieces made from found objects, like ones made from trumpets and other instruments. In doing so, he preserves some of the meaning of the original object, while giving it new life within the context of the new form. The history of Detroit lives in his work – one abstract piece has twisted metal from the Hudson’s building along with sections of the marble cladding that was removed from the Detroit Institute of Arts as part of their renovation project. One piece is more overtly political, a skinny figure made from found objects, with rather prominent, umm, “manhood” made from a rather phallic object used to fix holes in tanks, which was brought to him by a friend who was in Iraq. 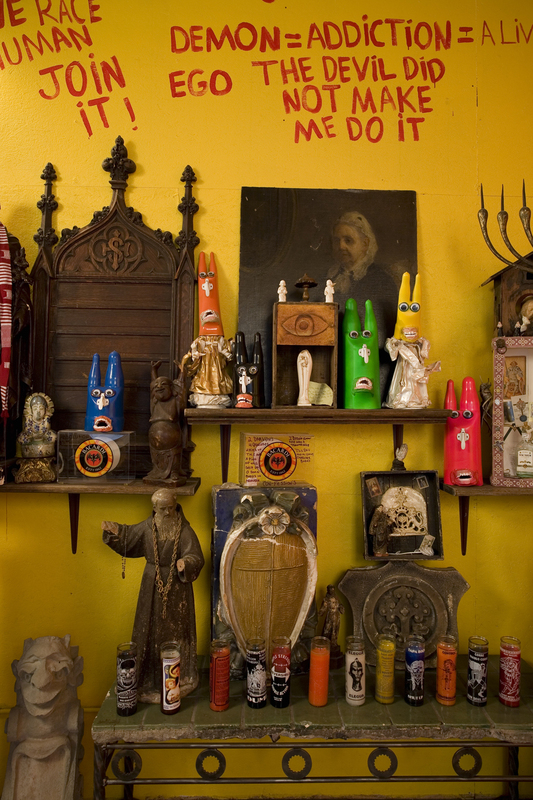 While this is a departure from the installation feel of the rest of the show, it works in concert with the others, and Burke too, gets in the spirit of installation with the creation of an altar piece on one wall.